Originally from Chicago, where Brian Bero established his own Special effects and model shop, Bero came to Hollywood to work on a single film, and has been making movie history ever since, working with the likes of Tim Burton, Arnold Schwarzenegger and Steven Spielberg, to name a few. 1996~97 saw the release of eight projects featuring Bero's talents. 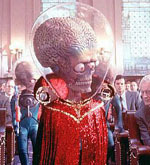 Warner Bros.' "Mars Attacks!" featuring Jack Nicholson and Pierce Brosnan; Universal Pictures, "The Lost World: Jurassic Park," directed by Steven Spielberg, Columbia/Tri Star's, effects heavy, "Starship Troopers," starring Casper Van Dien and Denise Richards; "Jingle All the Way," was 20th Century Fox' smash hit comedy; with Arnold Schwarzenegger and Phil Hartman, and Michael Jai White stars in "Spawn" for New Line Cinema. Released in 1998~99 were Touchstone Pictures, Robin Williams Sci-Fi / Drama, "Bicentennial Man," Universal Pictures' comedy sequel, "Blues Brothers 2000" and Metro-Goldwyn-Mayer sci-fi thriller "Species II"
While the year 2000 was incredibly busy, with six major productions, such as the release of Media Asia's "Tejing xinrenlei 2: aka Gen-Y Cops" from director Benny Chan, followed by Warner Bros. Television "ER". Keenen Ivory Wayans and Paramount's ending of a seven year journey... "Star Trek: Voyager". Some of Bero's other film and television credits include "The Outer Limits," "Arli$$,"
...2007 NBC's "My Name Is Earl" starring Jason Lee and Jaime Pressly and 2008 starts with "Nip/Tuck" and "CSI: Miami,"
2008 Brian joined the team of Showtime's "Dexter"
2010 included "The Vampire Diaries", "Raising Hope" on FOX and 2012 brought him to the NBC series "Revolution"
2013 added the MTV Music Television series "Teen Wolf"
Brian Bero's, expertise also spans, development, production, distribution and merchandising. Recognizing the power, of the emerging technologies, in relation to the entertainment industry, he continues to break new ground in the areas of design, as well as creating numerous, trend-setting effects. Bero is constantly working on providing the industry, with the highest quality effects that technology has to offer. Brian Bero lives in Los Angeles. Copyright 1999/2007 by Brian Bero unless otherwise protected by previous copyright.